Choosing the perfect wedding flowers for bouquets, table centerpieces, corsages, floral arches, and the floral backdrop is overwhelming. Though the option for wedding flowers is endless, their availability by season is an issue. This list will help you choose wedding flowers by season to celebrate the Big Day. Add cool vibes to your summer wedding with hydrangeas, which is also perfect for a blue theme wedding. Other blossoms to refresh the air are lotus, orchid, kangaroo paw, and allium. An experienced wedding florist will make a stunning bridal bouquet with lotus flowers to give a divine touch to the wedding. However, there are just white, lemon, and pink colors in lotus. For multiple choices in colors, you have kangaroo paw. The dome-shaped petals of Zinnias will make a stunning bridal bouquet for a summer wedding in February. Moreover, varieties in colors allow easy pick. For a delicate bridal bouquet, you have delphiniums. You can also stun your guest with flower arrangements of water lilies and freesias. When autumn rolls in, the weather becomes cooler. Orchids, Ivy, Gardenias, Dahlias, Lilies, and Gloriosas offer a choice to create unusually, but stunning bridal bouquets for an autumn wedding. You can also leverage the availability of dahlias for creating a large bridal bouquet. Any florists will bet on tulips’ versatility since they gel well with other blossoms seamlessly. A vase of tulips will give a classic look to a table. There is even a choice to combine these delicate flowers with green foliage to create an attractive bouquet. For other stunning flower arrangements, you have options in lisianthus, chrysanthemum, garden rose, and iris. With autumn in full swing during May, a couple of wedding flowers gets added to the list of autumn flowers. They all offer a high contrast to the wedding dress due to their color and long stems. Choose between calla lilies, carnation, gardenia, silver suede, and calla lilies. For a winter wedding in June, you can play with a different color with camellias, anemones, iris, oriental lilies, and Singapore orchids. The striking look and delicate petals of anemones in vivid colors can be paired with other blossoms or used monotonously. The layered petals and ball shape of ranunculus make them perfect for a winter wedding. These large head flowers in a range of colors make them ideal for any flower arrangements. For a sophisticated bridal bouquet, use daphnes. These small flowers with a strong scent will provide a cloak of fragrance to you. For a whimsical bridal bouquet, you can choose sweet peas. As the winter in August becomes moderate, you can go for wedding flowers that offer subtlety to any arrangements. If you believe in myths, pick oriental Lilies in white or pink since they are considered as a symbol of the goddess of love. A skilled wedding florist will also offer hyacinths as their star shape helps in lifting the visual appeal of floral displays. 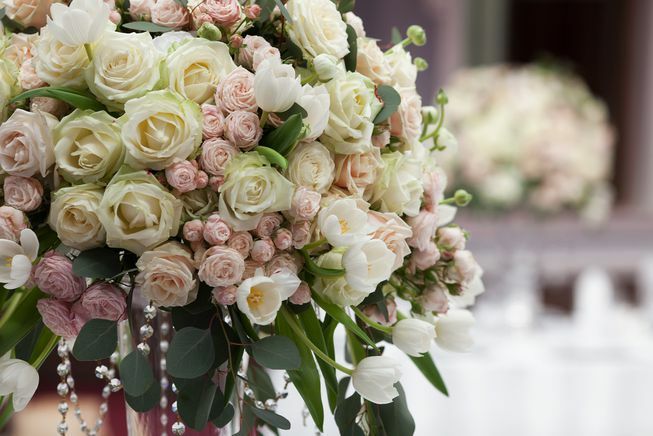 If variety and versatility in flower arrangements is your taste, then enjoy a spring wedding with cherry blossom, cymbidium orchids, freesias, anemone, anthurium, gardenia, and lily of the valley. Play to your heart’s content with these wedding flowers. Lily of the valley doesn’t go wrong with any wedding dress. When used in a bouquet, they add grace to the bride’s personality. To appear different in your wedding, pick blushing brides in crème color. Their strange looking pointed petals will represent your firm determination to stand by your groom in adversity and joy. Other flowers available in October are peonies, orchids, anthurium, and lisianthus. The fullness and bulbous shape of peonies have charmed brides to the core. Plus, a diverse range of colors makes them a popular choice for the wedding. Iris is another wedding flower that brides are looking for. Its unique shape of petals in white and purple offers a striking contrast to floral displays. Additional options for a spring wedding are orchids, gladiolus, delphiniums, hydrangeas, and stephanotis. As summer begins in December, you can add striking colors to flower arrangements with poppies. The soft, folded petals of blooms in red with a black center create a soothing contrast to bridal bouquets. If a soft and folded petal is not your choice, then you have gerberas. Their long petals in bright colors and wide shape make them ideal for a summer wedding. Besides these two, there are Jasmine, Anthurium, Carnation, Freesia, and Gladioli for a summer wedding. There are even a few other flowers that are available year-round. If you buy online flowers in Sydney, you don’t have to bother about their availability and season. Author Bio: Kiran Hurkadli is an owner of “Fresh Flower Sydney”, it is a famous florist in Sydney. Kiran is passionate about flowers and he loves to write blogs.